‘Family weddings can be hell. ...and, marooned in Italy for her cousin's nuptials, Ailsa can be forgiven for thinking that this one is worse than most. With the bride and groom at loggerheads and the guests in uproar, it is a million miles away from the rest and relaxation she'd been hoping for. And then suddenly, in the middle of the mayhem, she comes face-to-face with Nick, the man she walked out on just a few months earlier. 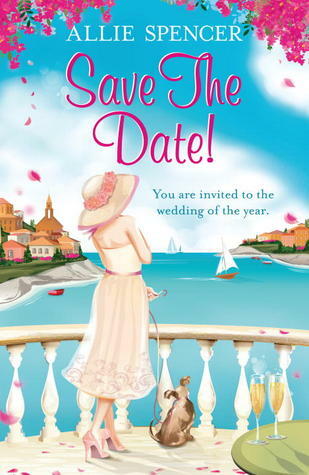 Save The Date was an easy choice for a recent holiday; I love the cover, perfect for a summer release and I looked forward to being transported to Italy through this story. I’ve heard very good things about Allie’s other books but hadn’t read any of them personally so was looking forward to reading this author’s work. I’m not huge fan of stories focussing on weddings so that was my only initial doubt as to whether I’d like this book. I thought this was an excellent fun summer read; it’s a very funny book with laugh out loud moments. These funny moments mostly concern Arthur the dog who is drawn to Ailsa as soon as she arrives at her (very posh) hotel much to her initial dismay but with some very funny and touching consequences. The dog is such a great character, I can see why if Allie’s friend owns a dog like this that she’d just have to feature him in a book, he should have a book all of his own! Ailsa is a very likeable character; she’s a strong but warm woman who is slowly coming to terms with the end of her marriage to Nick. Yes, of course it’s very convenient that Nick turns up at the hotel where the wedding is taking place when he never met Ailsa’s family but I loved it when he did arrive, he’s also a great character and there was excellent chemistry and anticipation between the pair. The supporting characters were also very strong with an array of typical and quirky family members. There was a great plot regarding possible attempts to sabotage the wedding which was executed really well and comically throughout whilst maintaining suspense as to whether the wedding would ever actually happen. Also because it wasn’t Ailsa getting married herself, any concerns I had about the book being all about the wedding were unfounded. I thought it was a well-balanced book between the Ailsa/Nick aspects of the book and her cousin’s wedding, and it was drawn together well. The location was idyllic and I felt like I was staying at this amazing hotel in Tuscany as well, making it a perfect sunlounger read. I was impressed by Allie’s style of writing, it came across as very modern and witty and I felt that it stood out because of this. A perfect read for summer!